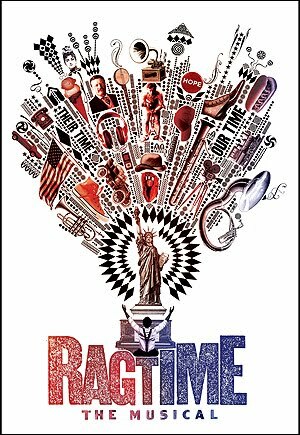 The revival of Ragtime opened at the Neil Simon Theatre on November 15, 2009, and I've already seen it twice. The book by Terrence McNally, based on the novel "Ragtime" by E.L. Doctorow, is about three sets of American experiences at the turn of the 20th century - upper class, established white Americans, blacks and immigrants. The three sets cross paths, not always for the better. Much of the story is told through the lyrics by Lynn Ahrens, set to the gorgeous, sweeping and very memorable melodies by Stephen Flaherty. 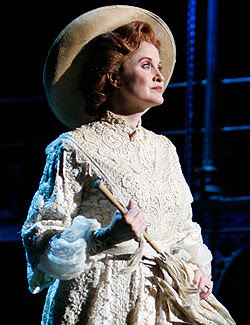 The musical first began on Broadway in 1997 and won the 1998 Tony Award® for Best Book of a Musical Book for McNally and Best Original Musical Score for Ahrens and Flaherty. This revival is a transfer from the Kennedy Center in Washington D.C. where it was produced last year. The main members of the cast are Ron Bohmer, Christopher Cox Quentin Earl Darrington, Christiane Noll, Robert Petkoff, Sarah Rosenthal, Bobby Steggert, Stephanie Umoh, Jonathan Hammond, Donna Migliaccio, Savannah Wise, Eric Jordan Young, Mark Aldrich, Dan Manning and Michael X. Martin. The three level set by Derek McLane is utilitarian and industrial. With the smallest additions of a chair or doorway, the set is transformed from scene to scene, taking us from Ellis Island, a large upper class home, a juke joint in Harlem, Atlantic City or even the Morgan Library. Director Marcia Milgrom Dodge uses the set to her advantage, keeping the classes separated and only mingling them when it absolutely advances the story. It's a big Broadway musical - big cast, big choral sound, big voices, big orchestra, big, open set. So much of the time, it was almost overwhelming in sound and sight - so many people, singing so loudly. But there are some wonderfully small moments. These are the moments that tugged at my heart and drew me in to this classic love story of America. The two actors responsbible for this were Christiane Noll (pictured below, beautifully costumed by Santo Loquasto) as the WASP socialite "Mother" and Robert Petkoff as the Jewish immigrant "Tateh." They each managed to portray tenderness and love over that expansive set and cast with the most subtle and nuanced performances. These are also the two characters that are the least static. This revival of Ragtime is a must not miss on Broadway this season. Discounted Ragtime tickets are available via Broadwaybox.com.